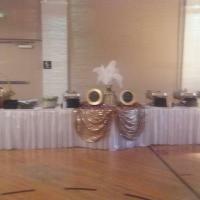 At Expressions Catering, LLC, we offer a variety of catering menu options to satisfy your every need, desire, and taste. We can also assist you in creating your own custom menu! Prepared with high-quality ingredients, new and old family recipes, and a little love in every bite, let our delicious menu options delight your senses with every bite at your next event or special occasion. From box lunch specialties to home-style foods, we have what it takes to make a good impact on your guests at your next event! We have a Wedding Package for our couples! Ask Chef Anita! Our package is a comprehensive selection, designed to meet your budget as well as serve your guests the highest quality of foods using fresh, locally grown products as much as possible. Love Pasta? Ask Chef Anita about those also! We supply the food, you supply the serving equipment, disposables and labor! Call us today to see how we can cater to you in our mobile kitchen! Contact Us to Create Your Custom Menu! Satisfy your hunger with our hot luncheon/dinner buffet! With our extensive line-up of options in entrees, starches, vegetables, salads, and desserts, you'll be sure to find a few (or more!) favorite dishes to showcase at your next event or luncheon. You and your guests will love our freshly-prepared dishes! 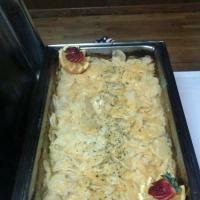 Our hot luncheon/dinner buffet option includes rolls & butter, coffee or iced tea, and dessert. Our variety of mouthwatering dinner dishes available in our dinner buffet are sure to seal the deal at the end of your event or wedding reception. From homestyle fried chicken to Asian-influenced chicken stir fry, these entrees will keep your guests coming back for seconds. 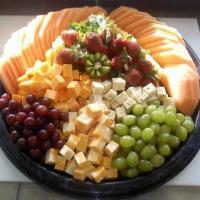 Not to mention, you have an array of vegetable and salad options that will keep your guests happy too. Bon Appetit! In need of some refreshments? We have a variety of classic and special drinks and beverages available to accompany any meal. 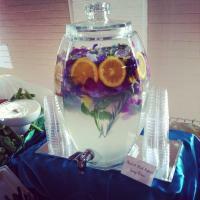 From the must-have tea to the revitalizing specialty punch, we'll take care of the beverages for you. Note: one gallon of beverage serves approximately 16 guests. Colombian Coffee or Decaffeinated â $10.00/gal. Orange, Apple or Grape Juice - $10.00/gal. 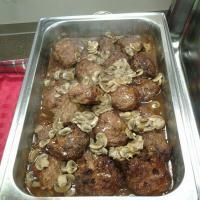 Let the sights and smells of our hearty BBQ buffet wow your guests! Our down home BBQ buffet offers tasty staple dishes like grilled brats, pulled pork, and coleslaw. It's no wonder people will be coming back for seconds if you host our BBQ buffet at your next event. Can't decide on what dish fits your fancy? Take a look at our personal favorites! These dishes are crowd-pleasers time and time again and can fit any theme or occasion. So leave the guesswork to us and pick from this selection of great homemade meals!